Biggest Farmer’s Market I’ve ever seen! Our latest epicurious trip to California brought us to the Sunday San Rafael Farmers Market, with over 200 local farmers, specialty food purveyors and artisans celebrating a vibrant local food scene. Long considered one of the premier markets in the state, this open market maintains its community roots by welcoming locals who have been taking home the freshest foods of the season since 1987. I was knocked out by the sheer size! and the variety, freshness and beauty of the local fare. 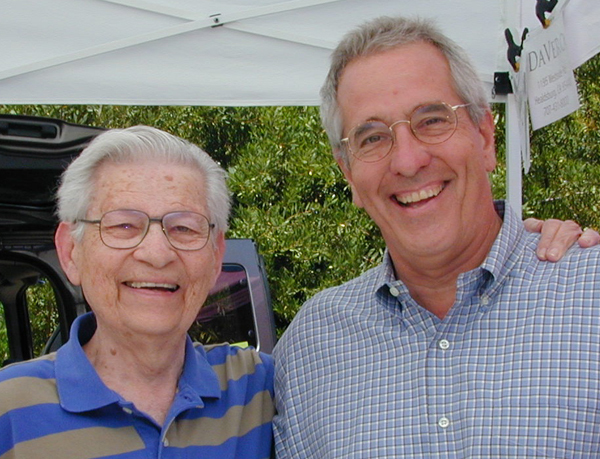 So was my dad – here’s his picture with the owner of DaVero olive oil. What a great day! We visited the beautiful mission-style St. Francis Winery surrounded by majestic mountains and breathtaking vineyard views, where we enjoyed a three-course wine and food pairing with Executive Chef David Bush – a delicious and distinctive wine tasting experience. The communal table seating was hosted by a friendly wine expert, and all of us – even my sister the vegetarian – had a relaxing and enlightening wine country experience. The smoked salmon, fresh peas and potato starter was a knockout paired with their Wild Oak Chardonnay. 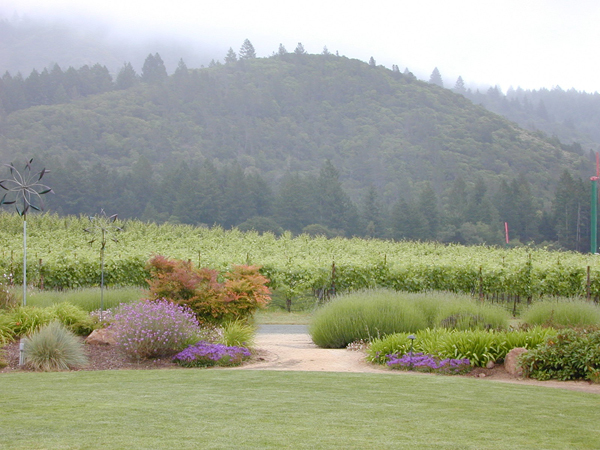 We visited Trois Voyelles winery in 2009 for a lovely wine tasting in the serenity of the Russian River Valley. Owner Edith Wilson explained her philosophy of “hang time” in wine making – letting the tannins and sugars balance during fermentation. I ordered a case of six Sauvignon Blanc and six Chardonnay delivered home to Maine, and I savored every drop. This is great wine and the Wilson-Flemings – Edith, Anthony and Olivia, the trois voyelles – are a great little family. TroisVoyelles is expanding their philanthropy this year to include some mighty important causes – read about their efforts at http://www.wfwines.com. Go, E, A and O! 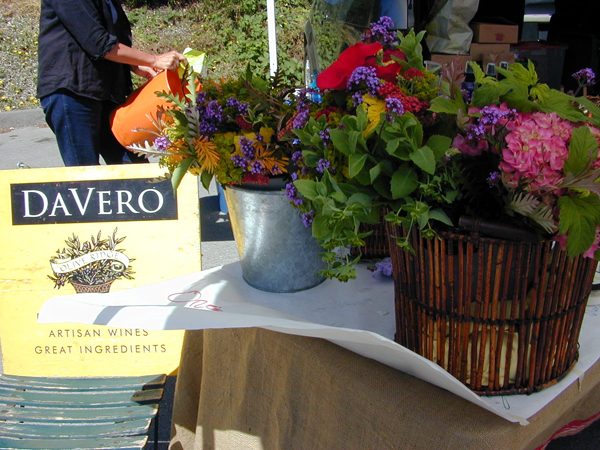 This entry was posted in Italian Travel and tagged California, Da Vero, DaVero olive oil and wine, Farmer's Market, fine dining, fresh produce, Hamden Hall Country Day School, local food scene, mission style architecture, North Bay, Olive Oil, outdoors, San Francisco, San Rafael. 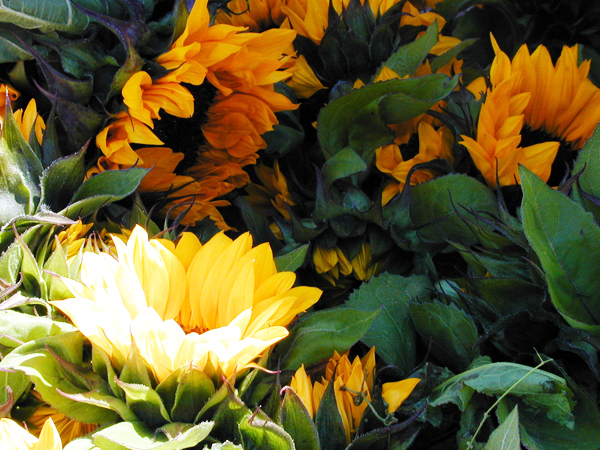 wine tasting, St. Francis Winery, sunflowers, Trois Voyelles, vineyard, Wilson Fleming Wines. Bookmark the permalink.